Hanoi (VNA) – The Vietnamese Government supports the Vietnamese and Australian defence ministries to strengthen practical and sustainable ties to match bilateral strategic partnership and contribute to peace, stability and development in Asia-Pacific and beyond. 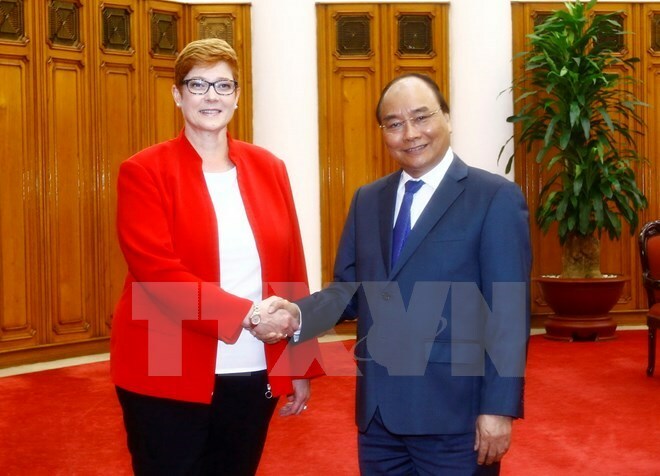 Prime Minister Nguyen Xuan Phuc made the statement at his reception for visiting Australian Defence Minister Marise Payne in Hanoi on August 24. He lauded the development of bilateral defence ties in line with the Memorandum of Understanding on defence cooperation signed in 2010. On the occasion, he asked for Australia’s further support in importing and consuming Vietnamese products, especially fruits and aquatic products. As regards the Trans-Pacific Partnership (TPP), he said Vietnam will seriously consider and discuss with Australian government leaders about the deal. On the East Sea issue, he wished that Australia would continue to raise its strong voice to support the settlement of the East Sea dispute by peaceful means on the basis of respecting international law and the 1982 United Nations Convention on the Law of the Sea, seriously abiding by the Declaration on the Conduct of Parties in the East Sea (DOC) towards soon reaching a Code of Conduct in the East Sea (COC). He also expressed his support for regional countries to enhance anti-terrorism collaboration. Payne, for her part, spoke highly of the bilateral defence links in the current global context, saying the ties had a historic advance, especially since Vietnam joined the United Nations Peacekeeping Mission. She said Australia always takes consistent approach to regional issues by dealing with them in line with international law. Hailing Vietnam’s role in the region, the guest said the TPP could still bring benefits to member states and the Australian government still pursues the deal.